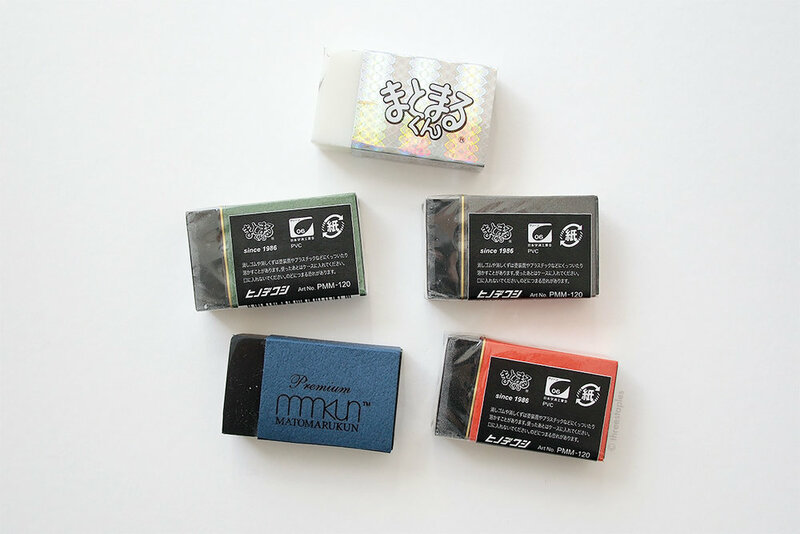 In a stationery-lover’s heaven called Japan, even erasers get special treatment once in a while. 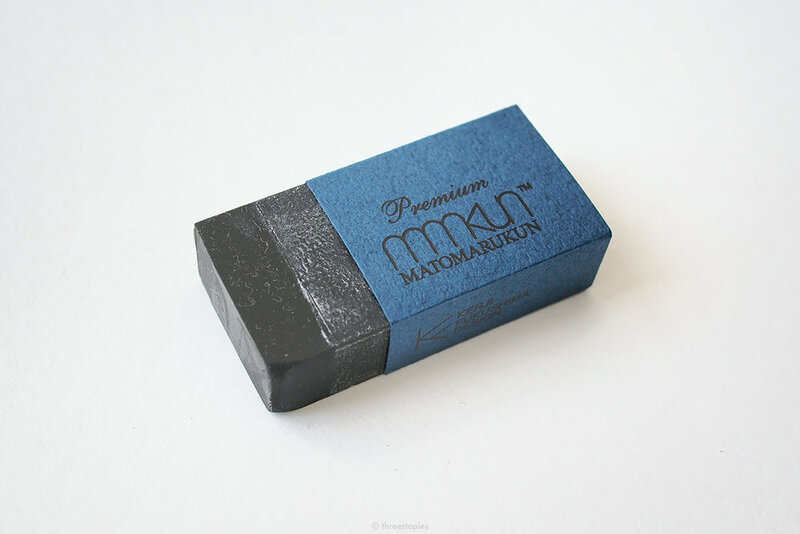 As some of you may know, Matomaru-kun by Hinodewashi is a common Japanese plastic eraser, and it seems quite popular among pencil enthusiasts. I myself fell in love with it last year when I tried it for the first time. So when I discovered these Premium Matomaru-kun erasers, I knew I had to get them. I had never seen this style of Matomaru-kun before, so I took this as an opportunity to visit the Hinodewashi website and learned that the Premium version was released in 2011 in commemoration of the 25th anniversary of the original Matomaru-kun, which was introduced in 1986. (Hinodewashi’s beginning goes all the way back to 1919). What makes this edition “premium” is that it’s designed by Kenji Fukushima. You can see his stylized design of Matomaru-kun logo (“MMKUN”) on both wider sides of the paper sleeve, his company name on one side, and the Hinodewashi’s logo on the opposing side. Instead of the mint color of the original sleeve, this version came in 4 different colors, all on fancy, textured paper, so that you can feel the designs printed on it. As for the familiar, bubbly “Matomaru kun” logo, it’s only found on the label that’s attached to the clear wrapper outside. The eraser itself (and the size) isn’t any different from the standard black Matomaru-kun, and performs just as well as the white one I have. My first Matomaru-kun, the Kira Kira version, is at the very top. Its design is the same as the standard version, except that the background color is holographic (kira kira means to sparkle or twinkle). I have to say, I really like the more subdued, sophisticated presentation of these erasers. I never had qualms about the playful design of the original version, but I can appreciate the “grown-up” feel of the Premium version, too. The white dust I found all over these erasers is apparently starch (see 2nd photo from the top of this post). In manufacturing, before the erasers are cut to size, they are stacked, so to prevent them from sticking to each other, starch is applied to the surface. They say to keep the eraser in the sleeve because the plasticizer that goes in the eraser can melt the paint on pencils (and other plastic products) and can get stuck together, if stored touching over a long period of time. I’ve absolutely had this happen to me in the past. Erasers and pencils in plastic pencil cases that I used in elementary school (and refused to throw out). Yup. The warning on the back says you should put the eraser back in the sleeve when you’re done with it, and to not put it in your mouth because of choking hazard. There aren’t many places in the US that carry Hinodewashi erasers. 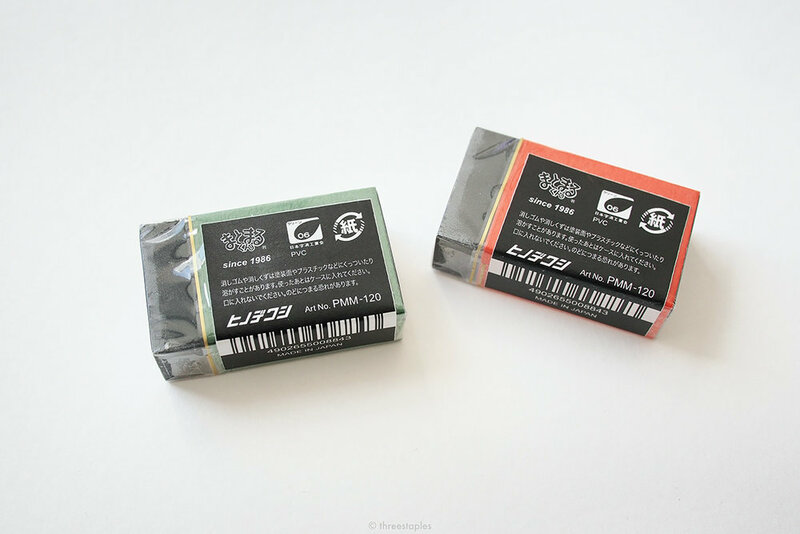 CW Pencil Enterprise has a few in stock, and I would whole-heartedly recommend them (they’re not sponsoring this post). As linked at the top, I purchased the Premium Matomaru-kun erasers at Amazon. The Amazon links in this post are affiliate links (my first time using them), which means, if you follow these links and make a purchase, I will be paid a tiny commission. Every little bit will help support the hosting of this site, and I’d very much appreciate it. Eraser Round Up — the weekly pencil. PS: In case you were wondering, matomaru means to gather or to collect in Japanese (referring to the eraser residue in this context), and -kun is a type of honorific. Wikipedia will explain the honorifics better than I can here, and be sure to check out the picture used for kun.